stretches along the Mediterranean to provide a warm climate and beautiful coastal scenery. Major cities of Languedoc-Roussillon include Perpignan, Nimes -which is a city on the border of the provinces of Languedoc and Provence , Carcassone Toulouse, Avignon, Narbonne, and Beziers - the main cities of Languedoc Roussillon, South France. The associated body of real estate agencies in the country (FNAIM) named the Languedoc as the top region for, long term growth, with figures showing the region enjoying 10.3% growth in house prices for the first quarter of 2006, putting it far and away into the top spot for investment. A survey by UK bank Abbey National also indicated that the Languedoc-Roussillon region was the most popular area for UK overseas property buyers.The survey revealed that the majority of these buyers were willing to invest between £50,000 and £150,000 in region's property. 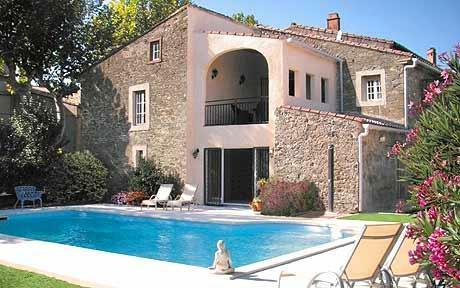 The region has seen arrival of new nationalities buying French property in Languedoc Roussillon region. Property buyers now include people from Singapore, Japan, Australia and South Africa. The traditional foreign buyers in the area, English, Irish, Scottish, Belgians, Dutch and Germans are also keeping the market strong. The climate has the French buying property here as well; they tend to be relocating from Paris and the north of the country’ The strong annual growth, combined with a strong rental market, where a 4 bedroom villa with a pool rents for 1000 euros plus in high season, makes this area an investor’s dream. Buying French property seems to never lose its attraction this is despite the emergence of several new European markets where prices are low and the short term profits are high. Overseas property buyers seem to put profits second place to the location of their homes. France is a wonderful location to buy a second home for retirement or as a holiday home the Languedoc-Roussillon region at this time appears to be very popular. France is a huge country and each region has something to offer the overseas buyer.